Our first paper from a collaboration with the Neilson Lab was published in PRB as an editor’s suggestion. Fe3PO4O3 is a frustrated antiferromagnet with triangular motifs that decorate a simple rhombohedral lattice. The geometric frustration produces an anti-ferromagnetic helical magnetic structure with unusual needle-like domains. 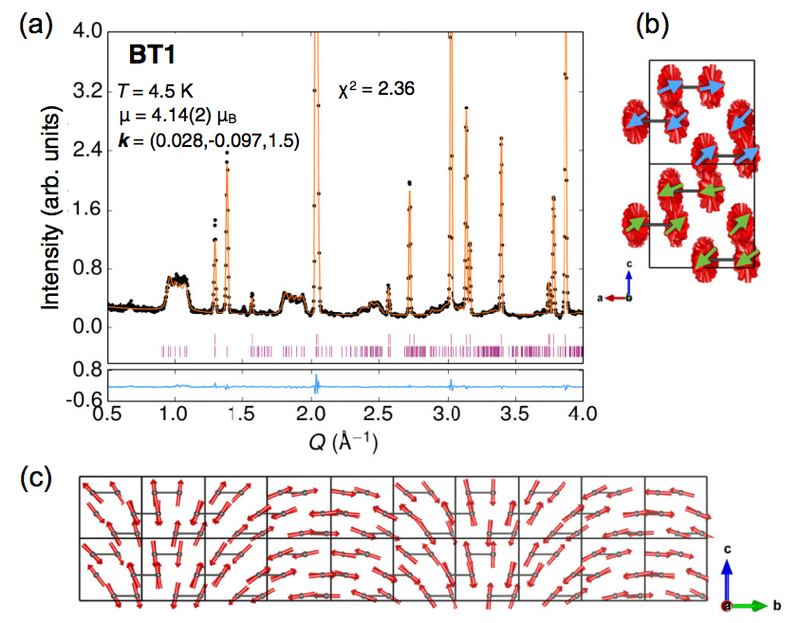 The domains are restricted to 70 Å in the hexagonal ab plane, while they are unrestricted along the c-axis, producing a very unusual neutron powder diffraction profile (see figure below) with broad and flat-topped magnetic peaks coexisting with a sharp magnetic peak. Due to the short correlation length of the domains in the ab plane, the material is expected to host many topological defects, i.e. domain walls or other defects, confined to be parallel to the c axis. Fe3PO4O3 could be of interest as a source of antiferromagnetic Skyrmions.